Fischer Didn’t Sign My Note. 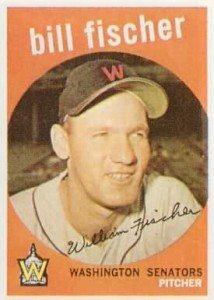 In 1962, Kansas City Athletics pitcher Bill Fischer bested a Hall of Famer’s record. Christy Mathewson posted a string of 68 consecutive innings without issuing a base on balls. Fischer smashed the mark, reeling off 84-1/3 innings devoid of walks. I wanted to know how the umpires behaved as the streak grew. Were they more careful, or even tougher, in their calls? I asked if this leadership skill helped him as a pitching coach for the Reds and later the Red Sox. Just like a Marine, the no-nonsense pitcher offered no personal reflection on his record. Tomorrow: Sharing a laugh with former White Sox pitcher Ray Herbert.